In a Johnson Ring Counter, the Q output of each stage of flip flop is connected to the D output of the next stage. And the compliment output of the last flip flop is connected to the back to the input of the first flip flop. Following figure shows the concept of Johnson ring counter. It is also called as Twisting Ring Counter or switch tail counter. Johnson counter can be implemented with SR or JK Flip Flop as well. As shown in figure feedback from almost rightmost flip-flop complement output to the leftmost flip-flop input. Initially all the register is cleared so output of QA, Qb, QC and Qd are zero. These are connected to back to the D input of the first stage of Da is one. The first falling clock edge produces Qa=1 and Qb,Qc,and Qd are zero. The next clock pulse produces Qa=1 Qb=1 QC=0 and Qd=0. Here 4 bit register is used so 4 bit sequence has a total of 8 sequences. Following figure shows timing sequence for four bit Johnson Counter. 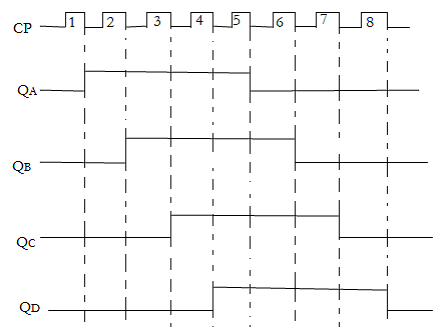 If we design a counter of five bit sequence, it has total ten states.